Which of this year's candidates for the Best Supporting Actor Academy Award do you think should take home the Oscar? Watch clips from their nominated performances by clicking on the embedded video players; then, be sure to vote in our poll below on who you think should win! Robert Duvall is no strange to the Oscars scene. He's been nominated six times (he won for 1983's "Tender Mercies") and scored his seventh nomination this year -- for Best Supporting Actor. The 84-year-old actor is in the running for "The Judge," the 2014 drama co-starring Downey Jr., Vera Farmiga, Vincent D'Onofrio, Jeremy Strong, Dax Shepard and Billy Bob Thornton. The film follows big-city lawyer Hank Palmer (Downey) who returns to his small-town roots where his father, the town's judge (Duvall), is suspected of murder. Hank's goal is to uncover the truth about the case; along the way, he reconnects with his estranged family. Ethan Hawke and director Richard Linklater have gotten pretty well-acquainted over the past decade. Not only did they work together on the "Before" trilogy about one love story ("Before Sunrise," "Before Sunset" and "Before Midnight"), but they also filmed the Oscar-nominated "Boyhood" over the course of 12 years. The coming-of-age tale follows a Mason as he ages from 6 to 18 -- with Hawke portraying his dad. "I like the way the world goes on," Linklater said with regards to the film, which is also up for best picture. "We capture it for a moment. It's there on our negative for all time, it's in the movie. But then it has its own life. I've always kind of loved that feeling that it was there once." Hawke has been nominated in this category before -- for the 2001 film, "Training Day." This isn't Edward Norton's first Academy Award nod either. He's been nominated twice before -- for "Primal Fear" and "American History X." For his latest nomination, Norton, 45, portrays Mike, an egotistical movie star who's cast in a Broadway play opposite faded actor Riggan Thomson (Michael Keaton), who's hungry for a big comeback. "You can do some satiric things," Norton told CBS News about "Birdman." "It's a little bit 'meta' as people have been saying, but in a lot of ways, it's not. It's just like coming up with any other character." NYFF review: Actors, camera soar in surreal "Birdman"
Norton faces competition in this category from his own castmate: Mark Ruffalo. This marks Ruffalo's second nomination. He was previously nominated for "The Kids Are All Right." In "Foxcatcher," Ruffalo, 47, stars as David Schultz, an Olympic wrestling champion and a devoted husband and father. "Foxcatcher" follows the tragic true story of wrestling's Schulz Brothers, Dave (played by Ruffalo) and Mark (played by Channing Tatum), both Olympic champions, who fall under the influence of millionaire John duPont (played by Steve Carell). Starring in "Whiplash" as an explosive and brutally demanding music teacher, J.K. Simmons finds himself in an unusual position: the center of attention. The small-budget film was made in just 19 days. Even if he doesn't win the category, the role has already started opening up doors for the 60-year-old actor. "It's been a busy time and a hectic time, but it's also led to great opportunities for the future, too," he told CBS News. "Doors that were kind of ajar have been kicked open. So the attention that all the awards stuff has brought for me has been great. Which nominee do you think should win the Academy Award? 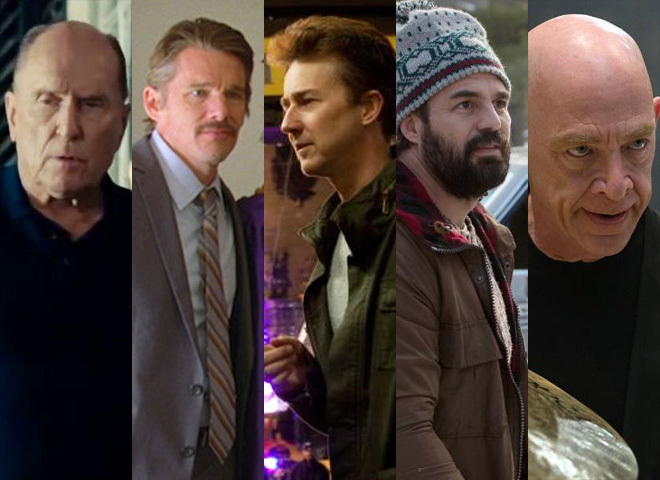 J.K. Simmons, "Whiplash" Ethan Hawke, "Boyhood" Robert Duvall, "The Judge" Edward Norton, "Birdman" Mark Ruffalo, "Foxcatcher"